Ever seen this before? Well, this is an old version of Windows, but it would look somewhat similar when you have policies that preset and prevents you from doing a Windows Update. Usually there is nothing you can do about it and hope that you will eventually get the patch, thanks to your company, but if you are the owner of this machine and has admin rights, then read on. Usually this is caused by GPO or similar policies preventing you from updating. Or you are not in the administrator group. To solve the GPO, you will need to fire up regedit. Go to HKEY_LOCAL_MACHINE \ SOFTWARE \ Policies \ Microsoft \ Windows \ WindowsUpdate \ AU. Delete the keys AUOptions and NoAutoUpdate. Go to HKEY_CURRENT_USER \ SOFTWARE \ Microsoft \ Windows \ CurrentVersion \ Policies \ WindowsUpdate. Alternatively, you can also use the Group Policy Editor. Fire up GP Editor by running "gpedit.msc" in command prompt. Go to Computer Configuration\Administrative Templates\Windows Components\Windows Update. Set "Configure Automatic Updates" to "Not Configured". Got to User Configuration\Administrative Templates\Windows Components\Windows Update. 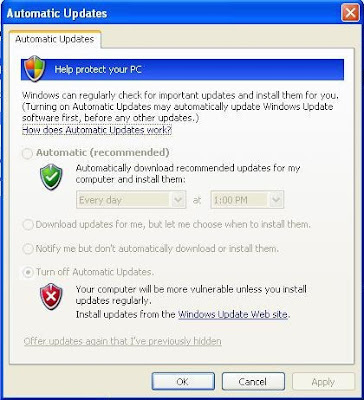 Set "Remove Access" to All and "Windows Update features" to Not Configured. On server, you may be able to run "gpupdate /force" to restart the policies, but a reboot is one sure way to get it done. Next, we sometimes wants to fire up Windows Update and do a on demand update. But in a company wide deployment, often you will get a no access page at Microsoft because the Windows Update Server is set to local. So, here is the way to get it done, via script of in command prompt. This will communicate with the update server and takes a few minutes. And when something does crap out, there is always a very detail log in %systemroot%/WindowsUpdate.log. You will find all your problems inside be it wrong server, connection timeout etc.